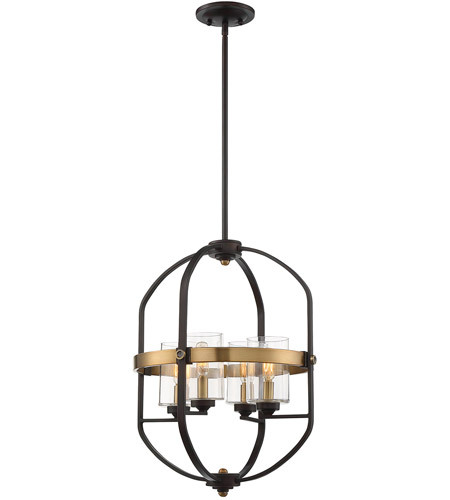 The Savoy House Kirkland 4-light foyer light offers edgy, architectural style that is perfect for today's fashionable interiors. 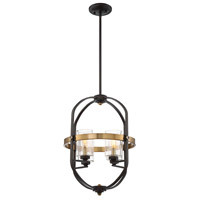 Its English bronze finish is accentuated by touches of warm brass for two-tone allure. Foyer lights are often used in foyers and entryways, but can also be used in great rooms, kitchens, offices, bedrooms and bathrooms too! This fixture can be hung from a sloped ceiling as well. Since the bulbs are exposed, try using stylized bulbs (not included) like tubular shape or Edison style for a different look! Kirkland can pair with hardware finished in black or brass, but you can also mix it with hardware in other finishes. 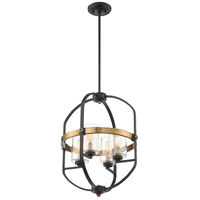 It is great for rooms with industrial, transitional or contemporary design touches. When you choose a Savoy House lighting fixture, you can be certain you’ve selected a piece that will withstand the test of time.